A day supposedly designed for love is not just about so-called romantic love, but about all the ways in which the people we know both trigger and support our great changes as we move through the chaos and tangle of life experience, says Emily Rapp. On Valentine’s Day 1998, I was sitting in my office in Geneva, feeling glum. It was cold, snowy, and gray in a city where it was easy to meet people from all over the world but very difficult to make friends. Geneva is a city of transients—super smart people coming to work for high-powered agencies or companies for two or three years, then moving on. At that point I had lived in Geneva since October, where I worked for an international relief organization. I was 22, and it was a strange time, full of the turbulence and questioning of that decade. I had turned down a full scholarship to the University of Chicago Divinity School, moved out of the house where I was living with one of my closest friends in Boston, and come to Geneva, I suppose, to “find myself.” What I found was that I was still afraid of the dark, making life in my one-bedroom apartment a bit tricky at night; unsure about what I wanted to do with my life beyond a vague desire to write books that would stop people’s hearts (in the best way); unfortunately convinced that the best and most romantic way to conduct a relationship was through letters (written not emailed); and that the wanderlust I’d felt for most of my life and thought I’d exhausted was actually just beginning. The phone rang. “RAPP,” I barked into the receiver, as it was custom to answer the phone by speaking your last name. No pleasantries here, especially since the caller might be calling from far away, with limited time and money to speak, and might say “hello” in a completely different language. It was my friend Emily, whom I’d met a few weeks after arriving, by chance, through a colleague who thought I might be lonely and had just met a woman she thought was smart and interesting. I took a chance and called her, and we’d been inseparable every since. “Life would be crap without you,” she said. That sentence, in a word, changed my relationship with Valentine’s Day forever, a holiday I had associated with the kind of traditional romance (dinners, dates, boyfriends, chocolates) from which I had always felt excluded. I considered myself countercultural enough that a lack of hearty participation in this Hallmark and society-packaged message of Valentine’s Day should not be have annoyed me, when in truth it did. I was young, and wanted life-changing, soul-rocking love. What I didn’t realize then was that I would not experience that until almost two decades later, and that there would be, in the interim, a massive metamorphosis triggered by the death of a child, which also took place in the cold, glum month of February, the night of Valentine’s Day itself. I had many crucibles yet to squeeze through and survive. “Same goes for you,” I said to Emily, and I meant it. Of course all friendship and interactions change our lives, but this one changed mine in a particular way. We traveled around Europe together, spent many nights drinking gin and tonics and smoking cigarettes on her back porch, and talked about issues and passions and our “previous lives,” of course, but it was the first time I had told anyone what I really wanted to do with my life—write—and the first time someone took me seriously when I expressed this desire. This phrase, “Hey, life would be crap without you,” was something we would say to one another for years—and still do—as we have never lived in the same city again. Of course a day supposedly designed for love is not just about so-called romantic love, but about all the ways in which the people we know both trigger and support our great changes as we move through the chaos and tangle of life experience. This is as it should be. Valentine’s Day is not a day about traditional romance as much as it is a day about moving through crucibles and emerging, changed, on the other side. To me, “the attempt of consciousness and desire to reconcile” reads like a theme statement for Valentine’s Day. The best friends, lovers, acquaintances, and colleagues are an integral part of our individual projects of change; they are witnesses to our wishes and dreams; they want to acknowledge our desires, as we do, in the open and in the light, as arrows of intention. 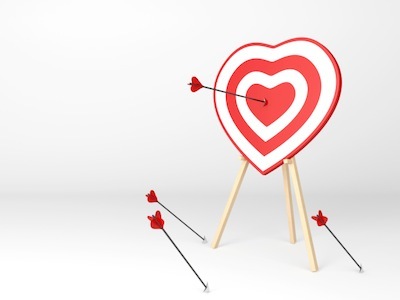 In this understanding, Valentine’s Day becomes a day to thank the people in your life who help collect those arrows on your behalf, and in the best case scenarios, equip you to let them loose to hit their targets. Role/Reboot regular contributor, Emily Rapp, is a professor in the University of Cailfornia-Riverside Palm Desert MFA program and the author, most recently, of The Still Point of the Turning World.